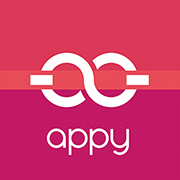 The Appy Couple website and matching mobile app are your primary tools for communicating and sharing with your guests. All the information you add or edit in either will automatically be reflected in the other. Aside from what your guests see, you can also access a variety of planning tools like the Guest List and RSVP Managers, Digital Stationery and more. Use the app when you're on the go. All features of the website apply to the app. If you have already downloaded it and signed in, you can edit content on the fly, and access your guest list even when not connected to the internet. You can also set up push notifications so you know immediately when a guest has requested access to your site or RSVP'd. The Appy Couple website and matching mobile app are your primary tools for staying up to date on wedding details. You can also use either to RSVP for events. The app is completely free for guests to download and all the information on your host's website will also be on the app. Use whichever is more convenient for you. Use the app when you're on the go. All features of the website apply to the app. If you have already downloaded it and signed in, you can access all information even when not connected to the internet. Additional features on the app include immediately adding pictures taken from your phone to the gallery and sending virtual champagne toasts to your hosts!